For the second layout pack of this week, Kenny and his team have created an Elementary School Layout Pack with 7 unique layouts. The layout pack is playful and colorful while still being professional and stunning at the same time. An excellent combination for an elementary school website that wants to attract new students. 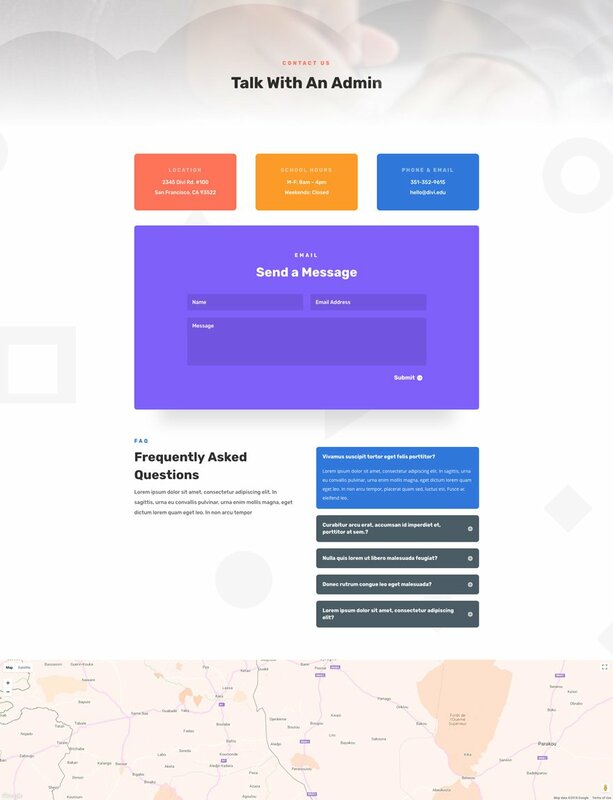 The Elementary School Layout Pack contains everything you need to set up a trendy and playful elementary school website. 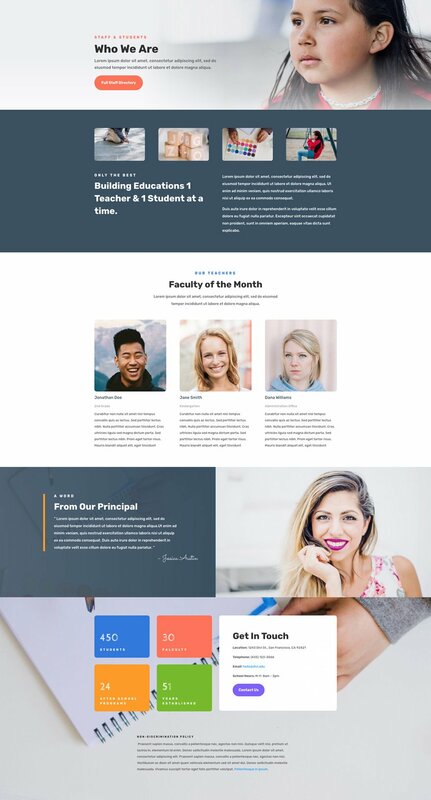 With its 7 unique layouts, bright color palette, playful choice of font families and professional look, the Elementary School Layout Pack will help attract both students and parents on your website. To access your new layout, simply activate the Visual Builder when editing a page and look for the “Load From Library” icon in the page settings bar (it looks like a plus symbol). Click this icon to launch the Load From Library popup. Under the Premade Layouts tab, you can easily find the new layout by scrolling through the list of layout packs. Once you find the Elementary School Layout Pack, click on it. You will see all the individual layouts included in the pack. Select the layout you want for to use and then click the “Use This Layout” button. Impressive usage of Divi modules features, fonts , colors and photos ! Not disappointed. This is candies for eyes ! Very nice. 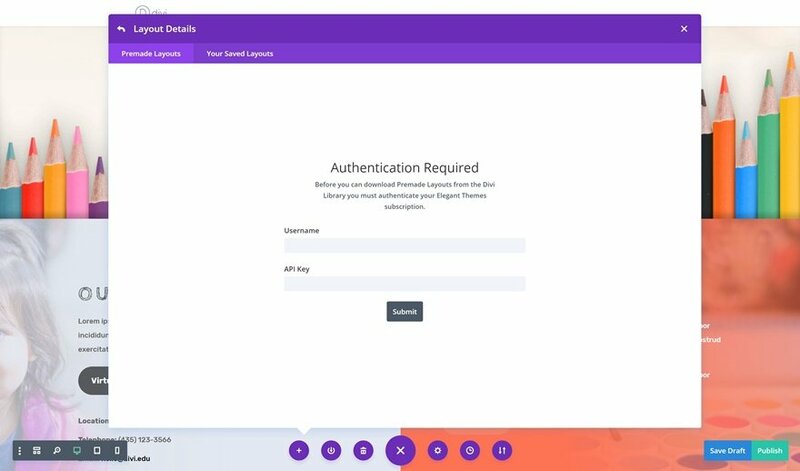 Thank you for including with DIVI so we don’t have to try to recreate it from a tutorial. This layout is very nice. You used amazing design tips.Each time, I am pleasantly surprised by your incredible imagination.This is where we see the difference between a designer and a webmaster. Congratulations to you, thank you.now, some words in french ..
Je suis agréablement surpris par toutes les astuces de design utilisées par Donjete, quand on voit ça, on se dit que l’on aurait dû y penser, mais c’est ce qui fait toute la différence entre un designer et un webmaster.Utiliser 3 modules de texte collés sur un autre pour faire croire à un menu, c’est tout bonnement génial. Encore mille fois bravo ! Especially the 3 columns layout on the homepage is amazing. Very colorful design. Grgeous! The Best Ever! Always getting Better and Better. Gorgeous! The Best Ever! Always getting Better and Better. Hell, this is a colorful layout. This is great work. How are the Date boxes made on the Our Upcoming Curricular Events & Activities” page? I see colored colummns but the date boxes are a bit lighter and I don’t see where that is done. Can you help? Found it…it was so white I couldn’t see that it was applied. Awesome layout 🙂 Thank you ET for sharing such an amazing resources! So much work has gone into the design and the result is stunning. Thanks Nick plus Kenny Sing and team. Vocês se superam a cada novo layout desenvolvido. I absolutely LOVE these layouts! I look at these free themes more for inspiration in regards to how modules and sections are used… and this one is an absolute Gold Mine of “Aha!”s … Thank you so much! This is a gorgeous design! It gives me a lot of ideas on how to design my website. I especially like the curved edges. However, why are Divi blog pages so boring????? I wish we had different options besides full width and grid for designing blog pages. Easily the best layout pack y’all have done! Love the creativity and use of color. May I offer a small suggestion? Could the sections on these layouts be labeled? It takes me, a rookie, a long time just to figure out what’s what. All the parts ought to be labeled. Or, doing your due diligence in learning what each is, could be considered a gift in itself. I say this not out of egotism (I have no reason or credentials for that), but from experience asking for help, not receiving it from creating a ticket, has helped me understand how so many Divi items work. Had I been told, I’d never be the Divi user I am today. Food for thought. Peace! 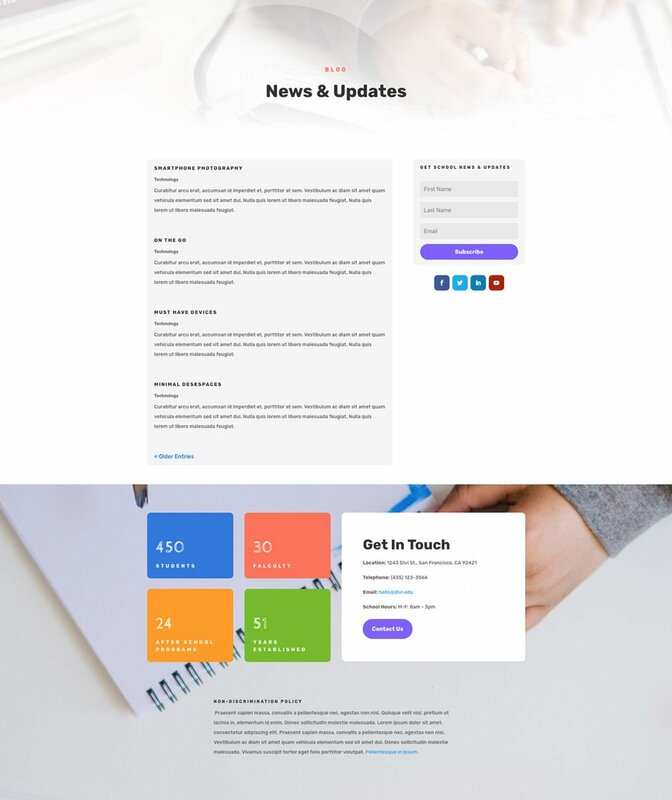 Divi is getting so close to being such a great tool for designing websites, once there is more depth such as header, footers, dynamic content and a major update to the modules I think safe to say Divi will be the #1 goto theme for designers. Now this is what I’m talking about. Nice design. Do you guys have a plan to make intermediate or college layout pack? Hi Rivka, maybe it’s late, however you can remove the cloud overlay in Insert Section’s settings. Click on Design/ Dividers/None. Hello, I need your help. I can’t remove the signature Jessica Austin… How can I do? Hey William, that signature is a separate text module. All you need to do is delete it. … sorry, I have resolved it!